Forcing a narrative into a predetermined structure plasters a story with artificiality. Effective stories deliver meaning to an Audience. The degree with which the structure of the story matches the thought processes going on within the receptive minds of those watching or reading shapes how cogent that message, or meaning, will be. Communication without friction, or at least, as little friction as possible: that should be the goal of most comprehensive stories. 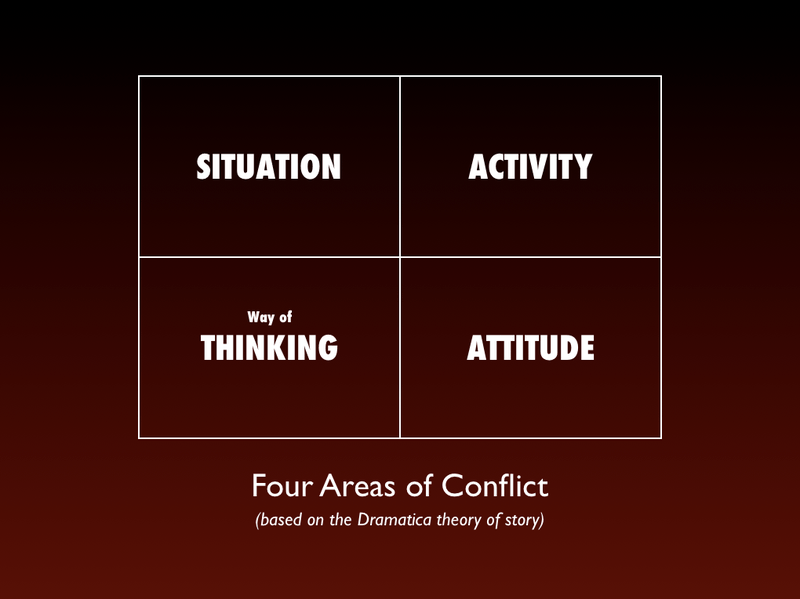 In order to achieve this, a writer should use the Dramatica concept of the Four Throughlines. Labeled the Overall Story Throughline, Main Character Throughline, Influence Character Throughline and Relationship Story Throughline, these match the Four Perspectives through which the human mind can appreciate conflict: They, I, You, and We, respectively. Assigning these four Perspectives to the four different areas of conflict molds a story’s personality. As mentioned in the first article of this series, A Conflict Unlike Any Other, the Main Character Throughline and the Influence Character Throughline are always across from each on the Structural Chart. Having the two Throughlines across from one another creates a natural connection when it comes to dramatic growth. Fixed Attitude causing you problems? Entering into a relationship with someone defined by their Situation and you’re going to have to do some growing. Thinking about things in a way that is causing you grief? Start a friendship with someone who constantly gets into trouble because of what they do (Activity), and your whole world will turn upside-down (A structural setup covered in a future article). But is there a concrete reason as to why these two Throughlines have to be across from one another? Yes, dynamic pairs offer the most opportunity for direct conflict. While not strictly binary, they come the closest to representing binary choices. We chose dynamic pairs as the basis for the Dramatica structure because they are a key component to linear thinking, which mirrors the bias of most American culture. Other potential models of story might find the Main Character and Influence Character in a horizontal or vertical relationship, but they would not come close to approximating the sort of conflict found in popular American culture (i.e., Hollywood films). While it would be great for someone to explore other structural models later this century, for now the film industry—and story at large—has enough on its hands trying to make this model work. Besides, the binary conflict found in the diagonal pairs suffices for the kinds of stories Audiences crave today. In earlier articles, we flopped the Main Character Throughline with the Influence Character Throughline in order to create a story with a different flavor. As we saw with Casablanca and Ratatouille, this switch gave the stories a unique personality. In addition, having a Main Character struggle with Fixed Attitudes while the story at large centers on Activities forces the Main Character to “arc” in a different way than if the Main Character struggled with their physicality or their station in life. But what if we returned the Main Character to that position in the Situation domain and instead flopped the Overall Story and Relationship Story Throughlines? Crafting a story where the characters struggle with how they think rather than how they act almost feels like it would be a story without interest. Closer examination proves this assumption unstable. Cut-throat, inter-office politics. Backstabbing and persuasions. The fashion industry finds conflict within the subtle and not-so-subtle manipulations between those who populate it. It is not so much what the characters do in The Devil Wears Prada that creates conflict, than it is their thought processes and their maniacal desires to get to the top (or stay there). Miranda is one of those already at the top. Everyone at worships her. Yet, it isn’t her Situation that defines her. Rather it is her Fixed Attitude and her belief that she always knows what is right that has the most impact on Main Character Alex. Alex’s Problematic Situation? Fresh out of college and defined by her lack of fashion sense, Alex must take what Miranda says seriously if the young upstart wants to be a success. And here is where things get interesting. Unlike the relationships between Luke and Ben or Morpheus and Neo, the relationship between Alex and Miranda centers on what each can do for the other. Miranda can jumpstart Alex’s career by leaps and bounds if only the young ingenue plays the game. Running crazy errands, making difficult phone calls, and in general doing the bidding of the queen of couture, describe some of the difficult things Alex must do to keep her relationship with Miranda alive. The conflict in their relationship centers around activities, not how they think. Now that we’ve switched the Main Character into a Problematic Situation and the Overall Story Throughline into Thought Processes, that same vertical relationship found in Casablanca and Finding Nemo exists. This means (assuming you’ve read the article Not-So Familiar Patterns of Story Structure), that Alex has some growing to do. She lacks an essential trait that many in her similar position face: they don’t realize what they already have. Believe it or not, Pixar’s Ratatouille shares a similar structural setup to the above fashion flick. But instead of focusing the story on what it is the Main Character lacks, Ratatouille gives us a great example of a Main Character waiting for others to finally see the light. Like Alex and Luke and Hiccup and Neo, Remy finds conflict because of his unique Situation: he’s a rat. Whether it’s a gun-toting granny, aloof French chefs, or even members of his own brethren, Remy finds it difficult to live because of who he is. Remy has issues with prejudice because of his external appearance. Linguini has similar issues because of what others think about him (internal). The presence of one naturally forces the other to grow. This is the beauty of the Dramatica structural model: its ability to accurately assess the qualities of a great story and to give a framework for natural conflict. Together, the two do their best to work together. The Fun and Games of a rat driving a human? Problematic Activities. Their Relationship is physical comedy, and not found in the Overall Story Throughline. Instead, the film centers the Overall part of the story on the problems created by those who think “Anyone can cook” and those who think the same. Here, it’s not space battles and kung-fu fighting that becomes the center of conflict. 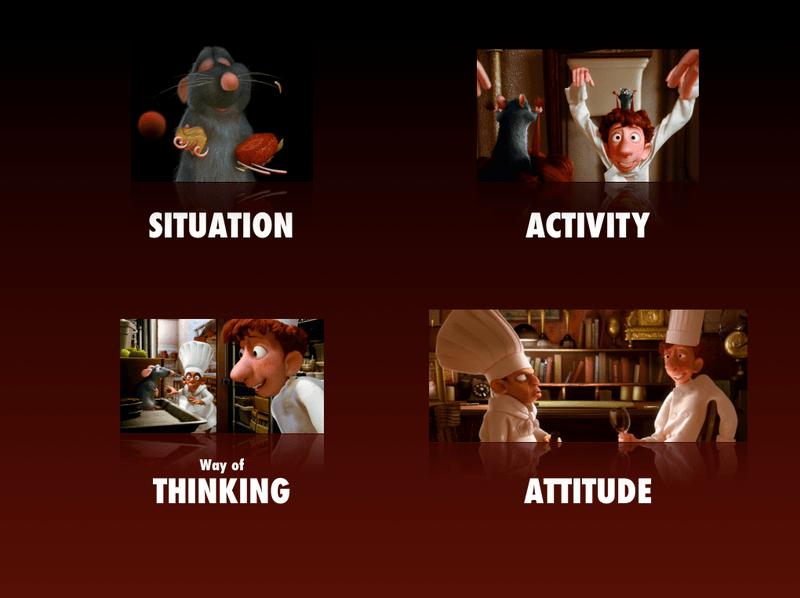 Instead, like Prada, Ratatouille focuses on characters manipulating one another in an effort to move ahead. The way characters think creates the conflict. Does Ratatouille feel more sophisticated than Kung Fu Panda? Certainly. The themes are more complex, the areas of conflict unique and surprising. Giving the audience what they expect is fine in some respects, but sometimes it can be helpful to turn things on their side and look at the problems and conflicts we face from a different point-of-view. This is all the structural chart is saying. It is not dictating what to say or how to say it, it is merely giving Authors with the knowledge of what it is they are trying to say and the tools to broadcast that message. Crafting a story with this natural story structure in mind guarantees the easily delivery of the purposeful writer’s meaningful agenda. In short, it helps writers broadcast their messages loud and clear.